April 1, 2016 – Montreal, Quebec – Critical Elements Corporation (“Critical Elements” or the “Company”) (TSX-V: CRE) (US OTCQX: CRECF) (FSE: F12). The management team and Board of Directors at Critical Elements would like to congratulate Elon Musk and the Tesla team for bringing the electric car to the mass market with style, sophistication and elegance. 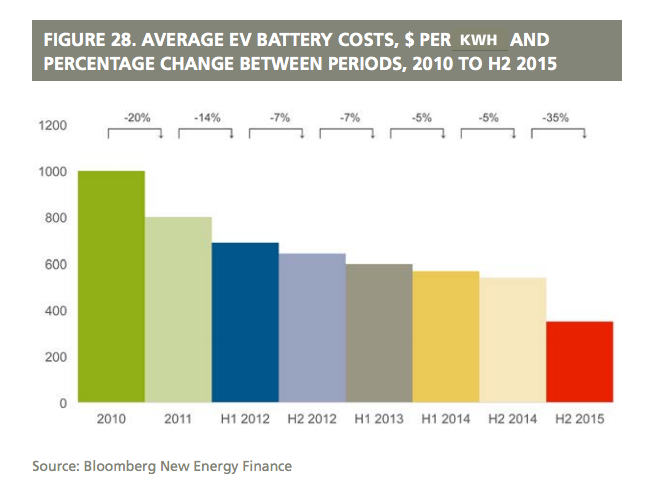 Moreover, Bloomberg New Energy Finance found that there has been a significant drop in the cost of the Lithium-ion battery, as the chart below demonstrates. The cost per kilowatt/hour has come down from approximately US$ 1,000 in 2010 to approximately $400 by year-end 2015. (Source: Bloomberg). Critical Elements believes that cost reduction trend will continue, and that the Rose Lithium-Tantalum Project could be a key element in the global supply chain of lithium for battery usage.